BEEP! BEEP! BEEP! The blaring alarm clocks jars the Gilde family awake to start the morning chores. Worn, soft clothes are slipped on quickly after fumbling around the floor, so the chores can begin on time. Hot, bitter coffee sweetened with a little dairy cream is gulped down as they trudge out to the barn with the smell of fresh morning air helping clear the sleep from their heads. The sight of a multigenerational family gathering in the barn to work together is the perfect example of an all-American image. Established in 1978, Gilde Brothers Farm began when Randy and his brother Steve with their wives, started milking around 100 cows. Since then, Steve and his wife were bought out in 1991 as the next generation began to take ownership. Randy and Mary’s sons, Nathan and Nick, along with their families were officially brought into the business in 2011 under the name Gilde Farms LLC. Named Top Quality Award winner at the 102nd Annual State Delegate Meeting, Gilde Farm LLC was unsurpassed by the nearly 50 percent of MMPA’s farms who received quality awards. While milking 220 cows and farming almost 1,100 acres of corn and alfalfa, this Lake City, Michigan farm maintained an average somatic cell count (SCC) of 47,167 cells per milliliter, pre-incubated (PI) bacteria count of 1,333 cells per milliliter and raw bacteria count of 1,083 cells per milliliter in the 2017 fiscal year. Excellent quality takes dedication and consistency. It also takes hard work to achieve. Although it was a shock to the Gildes to receive the award, they shared some of their management style that helps maintain their low counts. 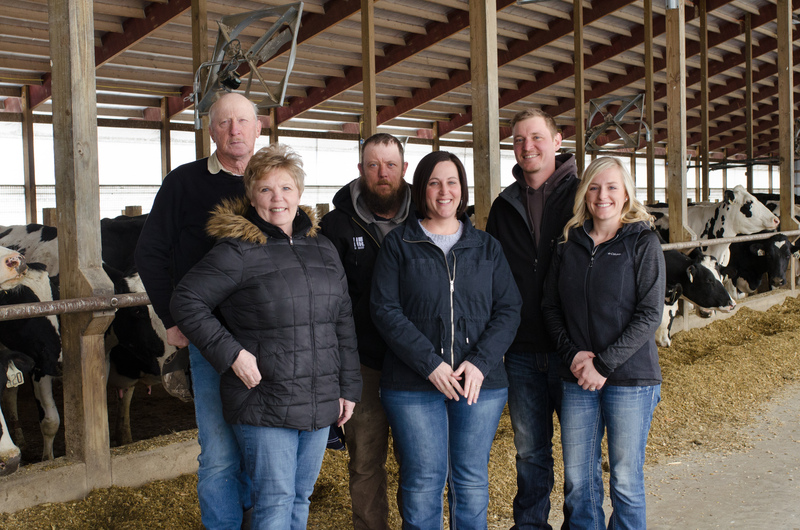 For the Gildes, it is truly a family effort to achieve such high milk quality goals. Each family member and six part-time employees has a part to play in giving the cows the VIP treatment all day every day. “There are two things we focus on for parlor management. We look at the milk filters after every shift for signs of inadequate udder prep and mastitis. Even though it is very low tech, it is the most effective way to monitor what happens in the parlor for us. I also watch flow rates and milking curves using the Afimilk system,” explained Nathan. The farm milks twice a day in a double six herringbone parlor using a strict milking procedure. As Nathan describes, they prep three cows at a time starting with dry wiping any loose debris, fore stripping to inspect the milk and pre-dipping in the first visit. They return to wipe the dip off and attach the milking unit within 60 to 90 seconds to capture the ideal milk letdown window. Hitting this letdown window helps minimize the time it takes to milk the cow and to get her back in the barn. After the milking machine is removed with automatic take-offs that are carefully calibrated to insure no overmilking occurs, each teat is post dipped with a barrier iodine dip before being released to go back to the freestall barn. Mastitis protocols include DHI or dairy herd improvement testing every three months, utilizing the cow-side CMT (California mastitis test) as needed and selective treating following milk culture results. In 2010, the farm invested in the equipment and training to conduct on-farm milk culturing to better treat cases of mastitis. “The main reason for the investment was to prevent overtreatment of cows. It has changed the way we look at mastitis and has even changed our management style focusing more on prevention and animal housing to keep them cleaner rather than dealing with the infections after the fact,” explained Nathan. The Gildes also have extra tank samples pulled twice a week to monitor bacteria counts closer and prevent problems before they occur. Quarterly, the milking equipment dealer does routine maintenance, checking the pulsators and vacuum levels to ensure proper working order and liners are changed every five weeks. Part of doing everything right for the Gildes includes doing their best to put family first. Making sure there is a place for the next generation is important to them as it is for many farms throughout the countryside. Even though Nick and Nathan’s children are still in school, they play a part in the family business. Hard work ethics and the high standards set for the farm are instilled so going forward the tradition of high quality will continue. As the sun sets at dusk over Gilde Farms LLC, the picturesque scene of calves bedded down in thick straw beds, cows comfortably getting a drink at the water fountain or eating at the feed bunk and the skid loader being parked for the night can be seen around the farm. Although the work of a dairy farmer is never complete, working with family is a tradition and a blessing at Gilde Farm LLC. This article was originally published in the May 2018 issue of the Michigan Milk Messenger.